Salmon has to be one of my favorite fishes of all time. I just love the taste, the texture, and smell of a perfectly cooked piece of salmon. Nothing beats it, in my opinion. So here we have an oven cooked or “poached” salmon fillet over brown rice and brocolini saute. Super mega retardly easy to do and takes little effort on your part. To start you need to make the pesto butter. Start with room temp butter about 1 stick. Add pre-made pesto or if you want to make it just blend together basil, Parmesan cheese, pine nuts, olive oil, and salt and pepper to taste. Mix with butter and allow to cool in fridge until hard again. Set your oven to 350. Place salmon fillets in a baking pan or baking dish and spoon pesto butter on top of each piece. I also added some fresh dill because I love the flavor of dill but you do not have to do that. Cook for about 15-20 mins. Now while that is cooking you can saute the brocolini with some olive oil. What I did to make it “special” was de-glaze with some chicken stock and added some goat cheese and thickened it with some corn starch, but that’s just me =). I served this all with some brown rice that I buy from Trader Joes, in the freezer section. Sprinkle some Parmesan over top to finish it off and enjoy the delicousness! You can also squeeze some fresh lemon on the fish too! 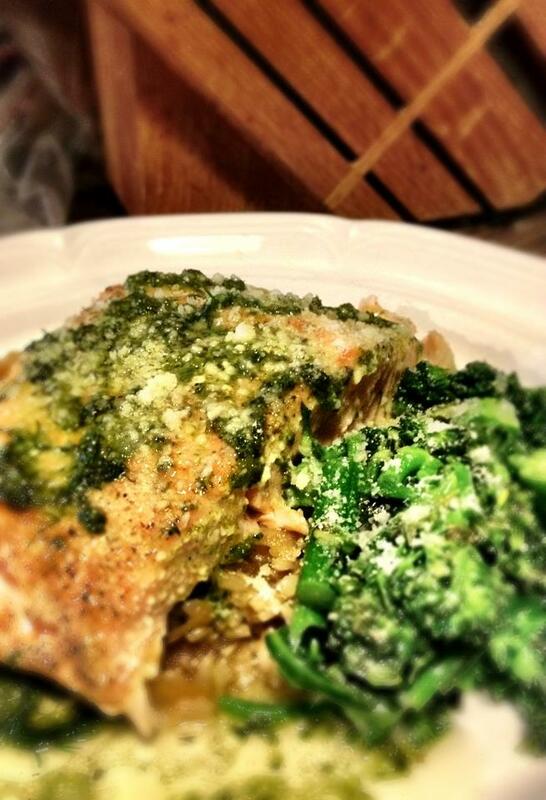 This entry was posted on March 7, 2012 by rrfoods in Dinner, Fish and tagged Pesto, Salmon.